Ella Rouge are described as "rock/alternative/power pop", suggesting in no way that they would be good or that I would like them. Yet somehow they are and I do! The only clue to this bizarre occurence is the fact that they hail from the pop mecca that is Stockholm. The first thing they reminded me of was Invisible People by the Wallstones, a very ace retro-style song from last year's Melodifestivalen. A tougher, cooler version of course, but the similarity is more in the singing. I suppose it's just down to Swedishness - perhaps I have now listened to so much Swedish music that I just automatically warm to anything with a Swedish singer. However, I really do think this song is excellent. Sadly I haven't been able to download an MP3, but you can listen to your heart's content on their MySpace page. Also, give their song That's Me With The Gun a listen too because it sounds quite like The Ark, another properly ace Swedish group. Sadly, Ella Rouge are far less glamorous than that comparison suggests - they appear to be a group of ageing, slightly dirty-looking farmers! The guy in the photo is Ludvig, the singer and only presentable-looking member. After Shayne won X Factor, I stuck up for him on Dirrrty Pop, saying that due to his mould-ability he has the potential to be a great pop star. He has nothing about him, just like Rachel Stevens, so he can be given whatever good songs are going and since he's a pretty good singer and has a strong public following, he will pull it off if anyone can. Anyway, you will be wondering what Shayne has to do with this song - it is in fact going to be his next single. When I first heard this news (on the Popjustice forums, where else? ), I was quite worried as it was described as the song of a "one man Westlife", which is the direction Shayne least needs to go in. However, this may be a soppy ballad but it really is a good one. After a couple of listens I like it a lot. It's not the poppy r'n'b/Darin covers I was hoping for, but it'll do for now and I hear that his album is very good too, so perhaps I will be proven right in my prediction after all! Now I suppose I'd better say something about Bryan Rice. He seems to have been pretty successful with this song in Denmark, where he's from. I presume he wrote it, cos he's not particularly pretty (although not ugly either, just boring-looking) and there's no point in pop stars who can neither make good music nor sell bad music through their beauty. This seems to be his only song so far, but I will be keeping an eye out for future releases. You may not think you've heard anything by Amiel before, but you probably have. She was the singer on Puretone's hit single Addicted To Bass and the much acer follow-up Stuck In A Groove and she sang a song called Meet Me In The Red Room on the soundtrack of Moulin Rouge. She released her first solo album in 2003 and had some success with the brilliant singles Lovesong and Obsession (I Love You) in her home country of Australia and in some of Europe and Asia, particularly Germany and Japan. This is a brand new song from her second album, These Ties, which is out now. Bizarrely, it has a rapper in it saying "Can I kick it? ", but Amiel's lovely voice more than makes up for it. The resulting sound is reminiscent of Tom's Diner by Suzanne Vega. In my last post I mentioned that Eiffel 65 has a song better than Blue (Da Ba Dee), which led to some confusion about what that song might be, which I am now dispelling by posting this. It was originally released in Italian entitled Voglia Di Dance All Night and then translated to make this piece of brilliantly joyful Euro synth-pop. Listen out for the fantastic middle 8: "Last night a DJ saved my life, Singing ah ah ah ah staying alive, Cause you make me feel, That that's the way a-ha a-ha I like it, I'm gonna dance all night". The band haven't really done anything since this was released in 2003, but the DJ from the group, Gabry Ponte released some scary dance music in Italian. I've been a fan of Elisa for years so it's great to hear that she's still going strong and making excellent new music. And doesn't she sound like Robyn in places? Elisa is the saving grace of the mediocre Italian music scene, when even Alexia and Eiffel 65 have run out of good ideas. 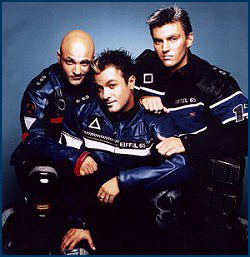 Actually Eiffel 65 only ever had one good idea and it wasn't Blue (Da Ba Dee). Back to Elisa, you may remember her from the gorgeous single she released in the UK a few years ago, Come Speak To Me, which you can listen to here. Swan is a dramatic, emotional song that really shows off Elisa's incredible vocal talents. This was one of the songs reviewed in the Stylus singles jukebox a few weeks ago and someone compared it to Alice Deejay so I of course had to hear it. Strangely, it doesn't sound like Alice Deejay at all, but it is very good. It's an electronic-sounding ballad with a lovely chorus. There's something late 90s/early 00s about it, and it really reminds me of a particular song that I can't think of. There's something All Saints-ish about it, and it would also fit well on Madonna's Music or Ray of Light album. It's a good day for girls from successful Scandinavian pop acts with "Mari" in their name releasing their debut solo singles, because here's another one. Marie Serneholt used to be in A*Teens and is the second member to release a solo song in Sweden since the band parted ways in 2004. The first was Dhani's mediocre pop-r'n'b effort Girl Talk, which wasn't a huge hit but I'm sure Marie will do better cos this song is perfect Swedish fluffy pop, and her popularity in A*Teens will ensure it doesn't go unnoticed. You can watch the video here but I will warn you, it may be upsetting - Marie has shed her sweet and innocent look for that of a Jessica Simpson imitator and it's a bit scary. For the pop education of Chris and the general sharing of pop aceness, here is one of the most underrated boyband songs ever! It's such a summery song, it's sure to cheer you up if you're feeling ill or depressed due to the rubbish cold weather and general February dreariness. 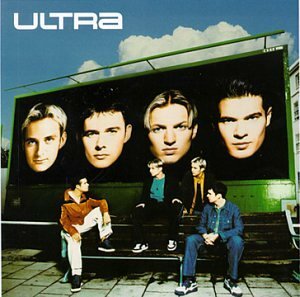 Some interesting(ish) facts about Ultra are that Alistair and James from Fame Academy 2 were both in the band at different times before they released anything, and they released an album which was quite popular in Italy.